I’ve never really been happy with my weight. I reached my highest weight ever after I had my 4th kiddo. I was able to, at that time, drop over 115 pounds. I was feeling great and starting to love my body. Then I got pregnant with number 5. Although this pregnancy was my easiest, and my most active pregnancy, I wasn’t able to keep off all the weight I lost. Now, as number 5’s second birthday grows closer, my unhappiness with my body is growing and I want to get back to where I was before. I was provided a MommySlim Premium 4-week Diet Kit and compensation in exchange for this post. Regardless, all opinions are entirely my own. Figuring out where to start is really the hardest part. What should I do? How many calories are safe while your nursing? How will I remember to eat healthy when I can’t even remember my name due to lack of sleep? I’ve asked myself these questions so many times. I was able to commit myself to an exercise program, but I was having such a hard time figuring out what to eat. I needed structure, convenience and someone to do most of the thinking for me. I was ready for MommySlim. Here’s the skinny after 4 weeks of the MommySlim Diet! When I started the diet I was pretty much exercising just to eat. So, basically I was eating when and what I wanted. I wasn’t gaining weight, but I also wasn’t losing. In the beginning of MommySlim, I was hungry. I was eating every 2-3 hours, but I was still feeling hungry. MommySlim has you eat every 2-3 on a structured program that takes out all the guessing and helps you not feel hungry. After day 2 of MommySlim my hunger went away. When I look back I realized it was just because I went from eating huge portions to eating healthy portions. I couldn’t believe was getting so much to eat on MommySlim by the end! MommySlim let’s you pick a customized plan, just for you. The diet plans are aimed towards 1800-2200 calories/day for nursing (breastfeeding and breast pumping) mothers, and Non-Nursing Meal Plans that provide 1200-1500 calories/day for non-nursing mothers who are bottle feeding their baby with formula. One of the biggest issues I have on regular diets, is the same thing every day. MommySlim had so much variety. Not only with the products offered in the kit, but with the eating plan. I loved that one day I got a strawberry meal replacement shake, and the next day I could have vanilla with a cup of raspberries blended in. The diet plan gives you flexibility to chose a shake or a bar, use the veggies you like with protein you prefer (thank you handy list of approved fruits, veggies and meats!). I am a professional dieter, and I’ve tried a ton of products. I really enjoyed the MommySlim products. The shakes are super yummy! I used ice when I made mine because I like them super cold. I also really like the Spicy Cheese & Pasta. I also loved that you could make pudding out of the shake mixes. I would also throw a breakfast cereal packet into my purse to eat on in the car, I don’t like my cereal with milk so it was like eating a package of granola…really yummy granola. I was really impressed with the results MommySlim gave me. I was able to lose a total of 13 pounds in 4 weeks. I know that never sounds like a whole lot, but really, it’s best to lose only around 2 pounds a week, so I think it’s fantastic! I was able to fit into my favorite skinny jeans again (woo-hoo! ), and MommySlim gave the focus I needed to commit to a healthy eating plan. I shared my results with a really good friend of mine. She is expecting her 5th child around Christmas. 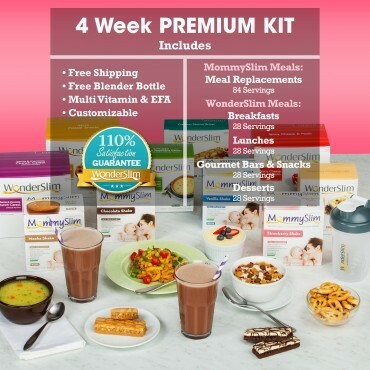 She told me she wants one thing for Christmas and that’s it…a 4 week diet kit from MommySlim! She was so excited to hear that she could breastfeed and do the plan! MommySlim is a weight-loss program specifically designed for new moms. My friend Aimee also tried the program, check out her posts here and here. There are many plans to chose from find everything you need here to get started! Have you had dieting ups and downs? I’ve definitely had ups and downs. It’s so hard! I love the variety in this plan though. That helps! I’ve never heard of those meals. You do look great! Congratulations and be proud of you!! You look Great! I would love to lose 13lbs in four weeks. That is fantastic! I don’t know anyone who is really happy with their body. But I think you are doing super! All those little things add up. I know how frustrating this can be because I’ve been there. I used to be overweight and tried so many things to lose weight. Nothing seemed to work for me. I was lucky to find a diet and exercise routine that worked for me and now I have lost several pounds in a short time without the horrible routines and bland diets. I have before and after photos and if anyones cares for what I’ve been doing and I’d be happy to help in any way. Just send me an email at Cherryl.Lizzy at gmail.com. I will show you the photos of my results and tell you how things are going for me with the stuff I tried. I just wished someone would have helped me out when I was struggeling to lose weight. So if I can help anyone it would make me happy. Good for you! You look great and if you can stick to it for 4 weeks, you can go longer! You got this! Looking good! Keep up the good work, and keep me posted. Good job on the weight loss. I feel your pain on the professional dieting. I’ve tried everything at least once – from wearing a plastic suit to doing an all juice diet. Nothing ever stuck until I just decided to change the way I was living. It’s really rare for a person to not have ups and downs. I’ve had my share! This sounds like a great program that could help get rid of some of that cheating. I’ve had PLENTY of ups and downs. My weight loss journey has been about as peaked and vallied as it can get. I have had lots of dieting failures. Thanks for sharing this program as I have not heard of it before. WOW, I sure would love to lose 13 lbs and fit into my jeans again! I’m really curious about this program, will have to look closer. All of these look so great! I think the marshmallow and chocolate looks the best! I have been down that same road. keep up the Great work. I love the variety. I could not eat the same thing over and over again. Losing weight is not easy!! I need all the help I can get when it comes to dieting! Nothing is better than being able to fit into your favorite pair of jeans! Congrats on the success – you look great! You look great! The food looks really yummy! Sounds like they have a nice selection. It is so hard to lose the baby weight! I’m a professional dieter too, it’s so frustrating! Thanks for sharing your experience. I love programs like this that pre-portion meals for you. It’s really convenient which makes me likely to stick to it. Good for you! I have started trying to figure out what I am going to do to lose weight. It is time (past time) to get it done. I may look into this! I can not seem to lose weight. I have never heard of this diet plan, but the food looks so delicious. I am trying to lose weight, and I have lost a few pounds, but I need to lose about 50 lbs. That is going to be hard to do. I have heard really good things about this program. I have been debating trying it myself.